Dr. Lorena Martin — the Mariners' new director of high performance — believes most of the players dealing with minor injuries to be ready for opening day. 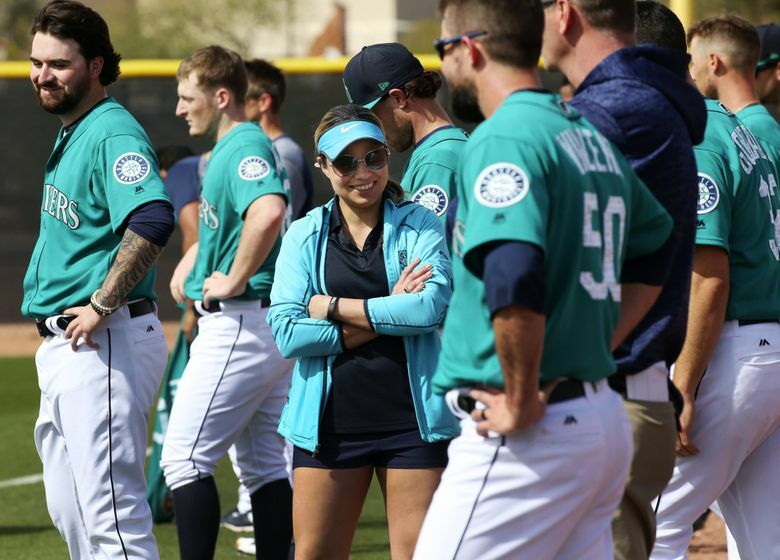 PEORIA, Ariz. — Given the list of players on the 40-man roster that are dealing with injuries — a total of 12 now — it would be easy to assume that Dr. Lorena Martin, the Mariners’ new director of high performance, would be a ball of anxiety and frustration. In her first year in the position and following the gushing praise of general manager Jerry Dipoto upon her hiring, there would seem to be plenty of pressure on Martin to keep what has been an injury-riddled organization over the past few seasons healthy and playing at an optimum level. But if she’s feeling any pressure, Martin hasn’t shown it. Given her position and background, overly emotional reactions to injuries — many considered minor — isn’t something that would be optimal. Is there frustration with the number of injuries? Andrew Romine — left shoulder partial subluxation. All seven players are projected to be on the opening day 25-man roster and Martin sees no reason why they shouldn’t. Ichiro and Segura are the most recent additions to the injury list, each exiting Wednesday night’s game early. Manager Scott Servais didn’t have many details when he met with the media on Thursday afternoon. Both players were still expected to meet with the team medical staff to go over further tests taken on Thursday morning. Servais used the phrase “heightened awareness” for the second straight day when asked about whether players would’ve exited games, or be out for multiple games, in the regular season with these issues. In the past three days, the Mariners have had Cano, Cruz, Ichiro and Segura leave games early with soft tissue issues. Martin said they were looking at altering warm-up routines while also pressing players on water consumption as temperatures have gone up. Martin understands the panic/anger/frustration with Mariners fans with all the players sidelined. *** Michael Marjama was scratched from the starting lineup of Thursday night’s game with a sore right leg. Marjama fouled a baseball off that leg during Wednesday night’s game in his final at-bat. He was limping in the clubhouse prior to the afternoon workouts. Marjama was originally slated to catch in the game. Instead, David Freitas got the start at catcher. It allowed No. 2 prospect Evan White to get the start at designated hitter. *** Marco Gonzales (right hand contusion) threw a bullpen on Thursday and is on track to make his start on Saturday. Gonzales had his hand wrapped to protect the nasty bruise and wore his glove, but he did not catch throws back from catcher Tuffy Gosewisch in the session. Instead, special instructor Pete Harnisch caught the throws and handed the ball to Gonzales. *** Felix Hernandez is scheduled to throw an extended bullpen on Friday of around 40-50 pitches. If all goes well, he would pitch in a game early next week. The Mariners are off on Tuesday. Even if they decided to bump it up to Monday or wait till Wednesday, the plan is for Hernandez to throw in minor league game and not a regular Cactus League game. The Mariners prefer a more controlled environment of a minor league game for Hernandez.